Many fiber optic network bids and Requests For Quote (RFQ) are citing cabling standards to specify the set of guidelines (such as fiber length) that the network installer must follow during the network installation. Adherence to such standards is meant to ensure the quality of the installation and guarantee that the network will perform as it was designed. The process of testing a network installation to ensure its adherence to specified standards is called certification, and often requires hardcopy documentation as proof of adherence to standards. 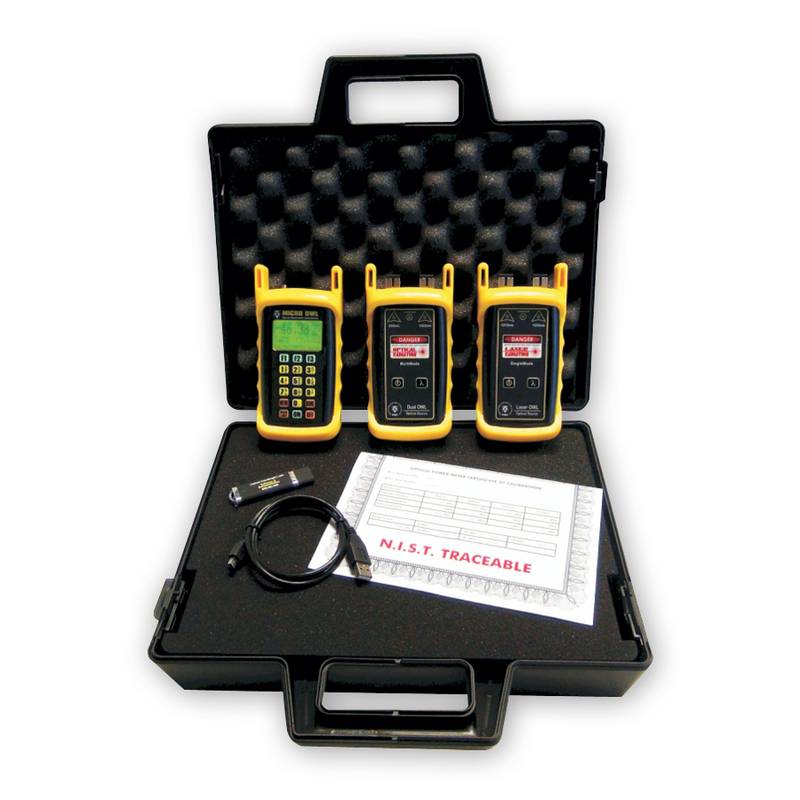 The Micro OWL 2 / WaveSource Quad Test Kit contains the tools necessary for certifying fiber optic links against a myriad of cabling standards, including two user-customizable standards, in both multimode and singlemode networks. The Micro OWL 2 optical power meter is multimode and singlemode ready, and contains a user-friendly Fiber Link Wizard that performs link budget calculation, and sets a reference value using the characteristics of the link. This reference is the PASS/FAIL threshold and is calculated against the chosen standard. Up to 1000 fiber runs may be stored, and downloaded to a PC for report generation using our OWL Reporter software. Its universal port allows connections to ST, SC, and FC, and also includes a 1.25mm universal port for connection to LC, MU, and other SFF connectors. The WaveSource Quad fiber optic light source contains all four popular industry-standard wavelengths in a single unit, designed for accurate testing and certification of multimode (850nm & 1300nm) and singlemode (1310nm & 1550nm) networks. Its quad-wavelength outputs are temperature-stabilized for accurate measurements. Two connector options are available: ST or SC. Conforms to the Harmonized European Standards EN 61326-1 and EN 61010-1. Battery Life up to 30 hrs. The process of testing a network installation to ensure its adherence to specified standards is called certification, and often requires hardcopy documentation as proof of adherence to standards. The Micro OWL 2 / WaveSource MM Test Kit contains the tools necessary for certifying multimode fiber optic links against a myriad of popular cabling standards, including two user-customizable standards. The WaveSource MM multimode LED source contains a single-port, dual-wavelength output (850nm / 1300nm), which is temperature stabilized for accurate measurements. Two connector options are available (ST and SC). The process of testing a network installation to ensure its adherence to specified standards is called certification, and often requires hardcopy documentation as proof of adherence to standards. The Micro OWL 2 / WaveSource MM / VFL Test Kit contains the tools necessary for certifying multimode fiber optic links against a myriad of popular cabling standards, including two user customizable standards. The WaveSource MM/VFL is a multimode light source. Its dual wavelength outputs (850 nm & 1300 nm) are temperature-stabilized for accurate measurements. A Visual Fault Locator is also included for near-end visual fault location and visual fiber identification. Two connector options are available (ST or SC). The Micro OWL 2 / WaveSource SM Test Kit contains the tools necessary for certifying singlemode fiber optic links against a myriad of popular cabling standards, including two user-customizable standards. The WaveSource SM singlemode light source has dual wavelength outputs (1310 nm & 1550 nm) that are temperature-stabilized for accurate measurements. Two connector options are available (ST or SC). The Micro OWL 2 / WaveSource SM / VFL Test Kit contains the tools necessary for certifying singlemode fiber optic links against a myriad of popular cabling standards, including two user customizable standards. The WaveSource SM/VFL singlemode light source has dual wavelength outputs (1310 nm & 1550 nm) that are temperature stabilized for accurate measurements. A Visual Fault Locator is also included for near-end visual fault location and visual fiber identification. Two connector options are available (ST or SC). The Micro OWL 2 / Dual OWL / Laser OWL Test Kit contains the tools necessary for certifying multimode and singlemode fiber optic links against a myriad of cabling standards, including two user customizable standards. The Dual OWL is our NIST traceable multimode light source. Its dual wavelength outputs (850nm / 1300nm) are temperature-stabilized for accurate measurements. Two connector options are available (ST and SC). The Laser OWL is our NIST traceable single-mode light source. Its dual wavelength outputs (1310nm / 1550nm) are temperature stabilized for accurate measurements. Three connector options are available (ST, SC, and FC). The Micro OWL 2 / Dual OWL 850 / Laser OWL 1310 Test Kit contains the tools necessary for certifying multimode and singlemode fiber optic links against a myriad of cabling standards, including two user-customizable standards. The Dual OWL 850 is a NIST traceable 850nm multimode light source. Its 850nm output is temperature-stabilized for accurate measurements. Two connector options are available (ST and SC). The Laser OWL 1310 is a NIST traceable 1310nm single-mode light source. Its 1310nm output is temperature-stabilized for accurate measurements. Three connector options are available (ST, SC, and FC). Battery Life up to 40 hrs. Battery Life up to 25 hrs. 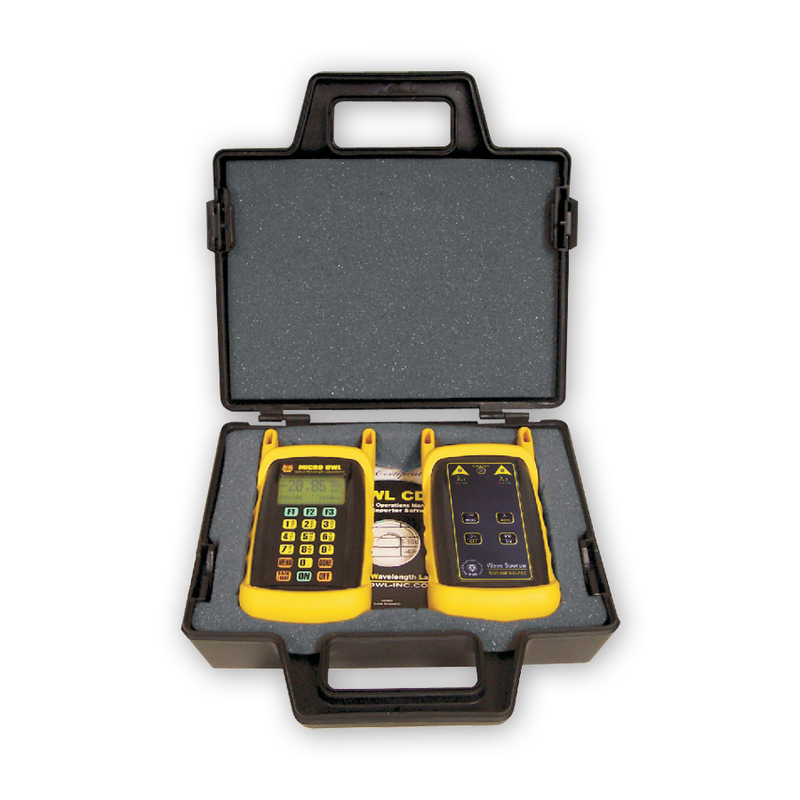 The Micro OWL 2 / Dual OWL 850 Test Kit contains the tools necessary for certifying multimode fiber optic links against a myriad of cabling standards at 850nm. The Dual OWL 850 is our NIST traceable multimode light source. Its 850nm output is temperature-stabilized for accurate measurements. Two connector options are available (ST and SC). EN 61326-1 and EN 61010-1. 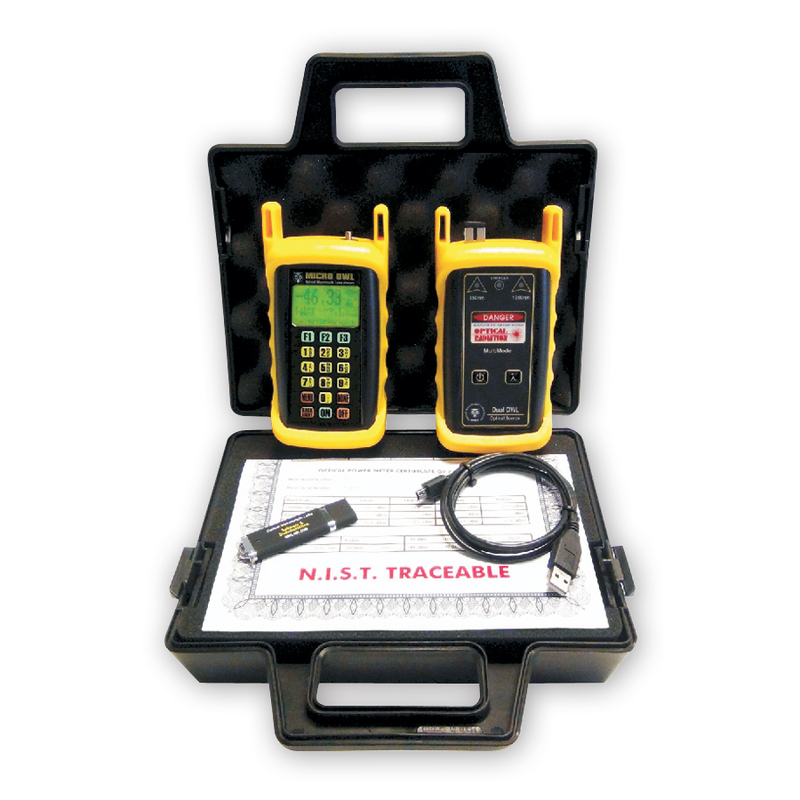 The Micro OWL 2 / Dual OWL Test Kit contains the tools necessary for certifying fiber optic links against the TIA-568-B.3 cabling standard in multimode networks. The Dual OWL is a NIST traceable multimode light source. Its dual wavelength outputs (850nm / 1300nm) are temperature-stabilized for accurate measurements. Two connector options are available (ST and SC).